Parkdale Toronto Hort General Blog: Why did my pear tree look so sickly this year? Why did my pear tree look so sickly this year? I'd like to share with you a very informative letter sent out by Laurel Atkinson at Not Far From the Tree. If you don't know about Not Far From the Tree, check out their website at the above link. They help city gardeners with large fruit trees that are hard to pick or which bear too much fruit for home use to (a) get the trees picked, (b) get some of the fruit for yourself, and most importantly (c) have much of the fruit donated to food banks, community kitchens, and places where people don't otherwise get much fresh fruit. 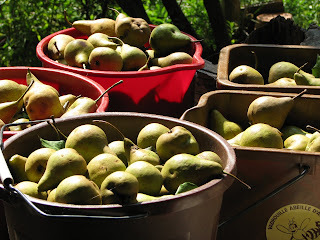 Although we were able to donate 5 buckets of pears from our cottage to Not Far From the Tree, our city pear tree had a complete crop failure. The picture tells the reason why - a very bad infection with pear trellis rust. Below, Laurel tells you all about this fungus and how to help your tree for next year. The main thing to know is, you don't need to cut down your pear tree! This season, many of you have been sharing disappointment about your barren pear trees and bewilderment as to the cause. Others have sent photos to us showing orange spots on your tree’s leaves, which have grown bigger over the course of the summer. I wanted to take the time to fill you in on some facts about this issue, as well as steps you can take to help prevent it from rearing its head next year. 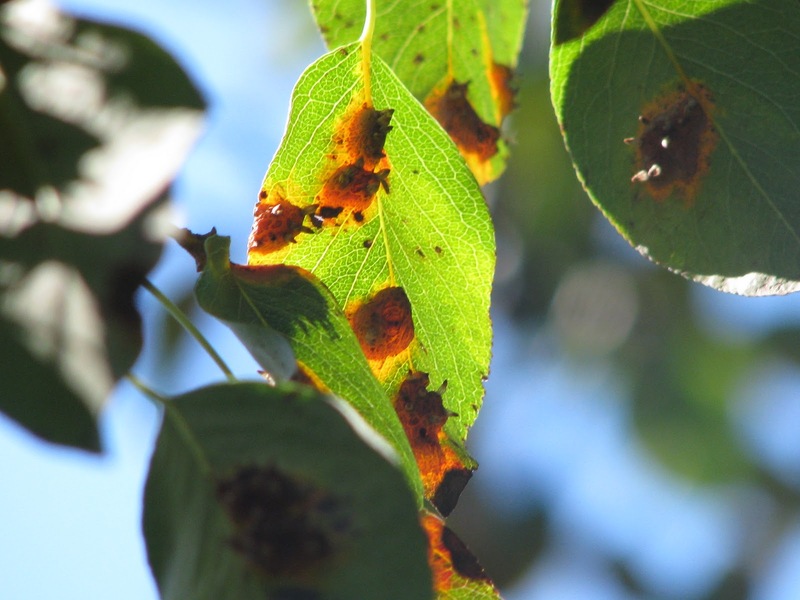 The orange spots and lack of fruit are tell-tale symptoms of pear trellis rust (or for the Latin-loving among you, Gymnosporangium sabinae), a highly contagious fungus which affects pear trees. 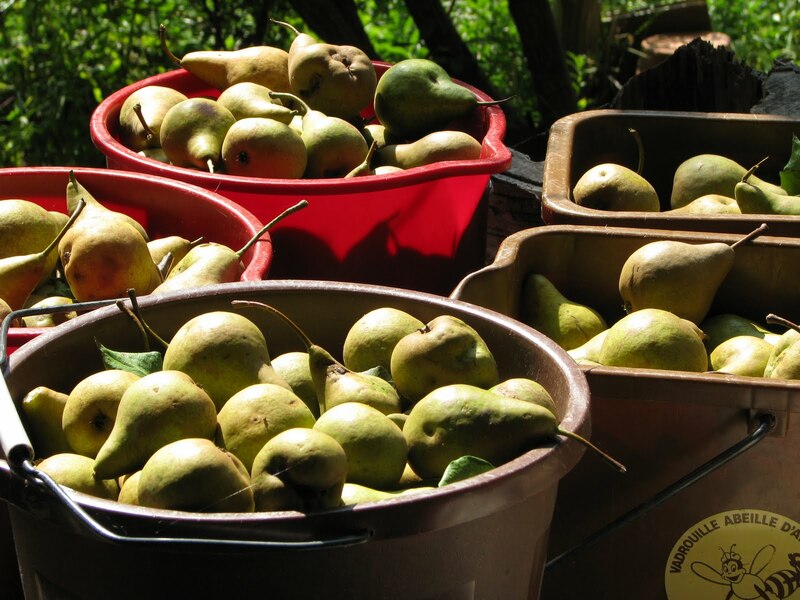 Last year, we picked 10,000 pounds of pears, but this year only 25 pounds. The fungus is airborne, disperses far and wide, and has affected almost all of our registered trees. We did manage to pick one pear tree out of our 260-odd registered pear trees -- far outside the downtown core -- that was robust and healthy enough to produce pears even though it was beginning to show signs of the fungus. Are other trees or plants at risk? 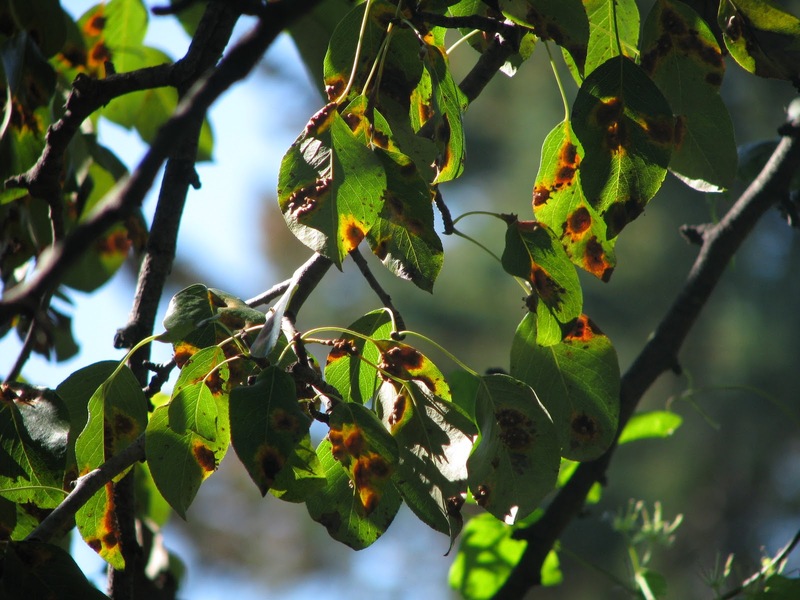 Pear rust not only affects pear trees, but junipers as well, which host the fungus through the cold winter. The fungus “hibernates” in galls (growths) on the stems and twigs, which may not be visible to the untrained eye. These growths will become obvious in the late spring (April - May), shortly after the beginning of our rainy season, when an orange residue -- the fungal spores -- prepare for a journey to their new summer homes on your pear tree. Once your trees leaves have fallen this autumn, remove them from your property -- that’s right, no mulching or composting for these guys. Lest you be tempted to pluck all the leaves from your tree before they fall naturally, remember that your tree still needs to produce energy from the sun to prepare for the spring, and the only way to do this is through its leaves. Secondly, have a look around your immediate area (either your yard or a neighbour’s yard) for any juniper shrubs. See if you can come up with a plan to ensure that the fungus doesn’t get a chance to disperse next spring, either by inspecting them in the winter or in the late spring (when the spores will be obvious). The only way to get rid of the fungal spores is by pruning and disposing of the galls. You may be tempted to try to hunt down a fungicide spray to deal with this issue. However, not only is this illegal under the Provincial Pesticide Act (unless you’re an arborist with the proper training), but the Ontario Ministry of Agriculture and Rural Affairs (OMAFRA) says that there is no known fungicide that works against pear trellis rust. (OMAFRA also recommends not planting pear trees and junipers within one kilometre of each other, but something tells me that you may not have control over your neighbour’s prized juniper bush). Thanks to all the pear tree owners who sent us in photos, stories, suggestions, and questions. Special thanks also to the OMAFRA website and other folks who helped us better understand this fungus. With a little bit of love, we can nip this fungus among us in the bud (er, gall)! Just wanted to say a big thank you for donating these lovely pears to Not Far From The Tree. I delivered them to Parkdale Activity Recreation Centre. I was literally followed by folks from the sidewalk outside to the kitchen, all of them eager to get their hands on these lovely-looking pears. Al, who works in the kitchen, was ecstatic to receive pears because we haven't picked any this year due to the fungus that is going around. It was really a magical moment to be able to donate this fruit. Should we let all our ash trees die? Images copyright as credited. Awesome Inc. theme. Powered by Blogger.